Soon we will go into space to stay. We have performed all the necessary theoretical work. We know how it will be done, and we can foresee some of the problems we will encounter. We are working with the prototypes of the devices which will finally overcome the greatest barrier of all: gravity. What remains now is only for the engineers and scientists to make the final steps . . . and they may already be making them. The race for the artificial satellite and space flight is on! In this greatest adventure of all history, America’s pride and national prestige is at stake. There is no doubt in the minds of our rocket scientists and guided missile engineers that a satellite can be placed in space. They want America to do it first because, as free men, we want others to enjoy the freedom we have. We would use our satellite to prevent war; we would also use it for peaceful research in chemistry, electronics, astronomy, physics, cosmic rays, biology, and a host of other fields. Our national reputation is such that we may even offer the services of the satellite research laboratories to other nations much as we are doing with our atomic research in President Eisenhower’s “Atoms for Peace” program. An unmanned satellite will be first. Then we will build Intercontinental Ballistic Missiles and may have to run extensive experiments with manned rocket planes such as the Bell X-1A, only bigger. But in the not too distant future a manned satellite will circle the earth in space. To transport men and equipment to this manned space station orbiting around the Earth, we will have to have great towering ships powered by banks of rocket engines which gulp tons of fuel each second. Many rocket men â€” Dr. Werhner von Braun being the foremostâ€”have conceived huge three-stage rocket ships capable of making the flight to the space station. But recently a group of engineers from the Goodyear Aircraft Corporation told the American Rocket Society in New York how to do it easier, cheaper and more reliably. These three menâ€”Darrell C. Romick, Richard E. Knight, and John M. Van Peltâ€”are working today on super-secret government rocket projects, but, as with many of their colleagues, they are very serious about the coming age of space flight. Darrell C. Romick, for example, is chairman of the American Rocket Society’s 1955 Space Flight Symposium held at Chicago in November. Their technical paper, entitled “A Preliminary Design Study of a Three Stage Satellite Ferry Rocket Vehicle with Piloted Recoverable Stages,” presents a new approach to the old ideas and conceptions of space ships. Rocket people have known for a long time that a rocket which could escape the Earth’s gravity would have to be big. Essentially, this theory is simple. 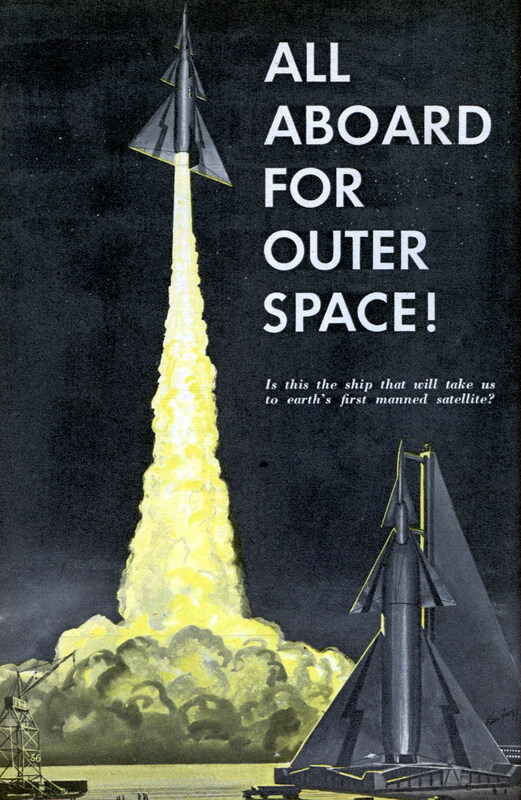 With a single-stage rocket such as the V-2 or Viking, the rocket engine must push the entire ship, including those fuel tanks which are already empty and therefore useless weight. The step rocket principle merely states that you must throw away what you no longer need once its usefulness is exhausted. This simple principle means that a ship will have to use less fuel to lift the same amount of payload away from the Earth; in fact, the step rocket principle makes space flight practical. And the principle has already been checked and proved with the two-stage V-2/WAC-Corporal “Bumper” rocket in which the WAC took off from the nose of the V-2 at high altitudes after the V-2 had exhausted its fuel. The V-2 alone was capable of reaching 132 miles; the WAC by itself could reach about 50 miles. Together, they did not reach the sum of these, 182 miles, but the altitude of 250 miles! But when these used portions of the space ship or step rocketâ€”the lower stages or boostersâ€”separate from the rest of the craft, they fall back to the ground again. The recovery of these big, complicated, and expensive boosters has always been a problem. Scientists have suggested that the launching sites be located on sea coasts to allow the boosters to fall into the ocean away from densely populated areas. Some schemes have been presented for recovering the boosters by parachutes. However, the three Goodyear engineers have designed a three-stage space ship whose boosters are manned with crews and flown back to the ground as gliders! 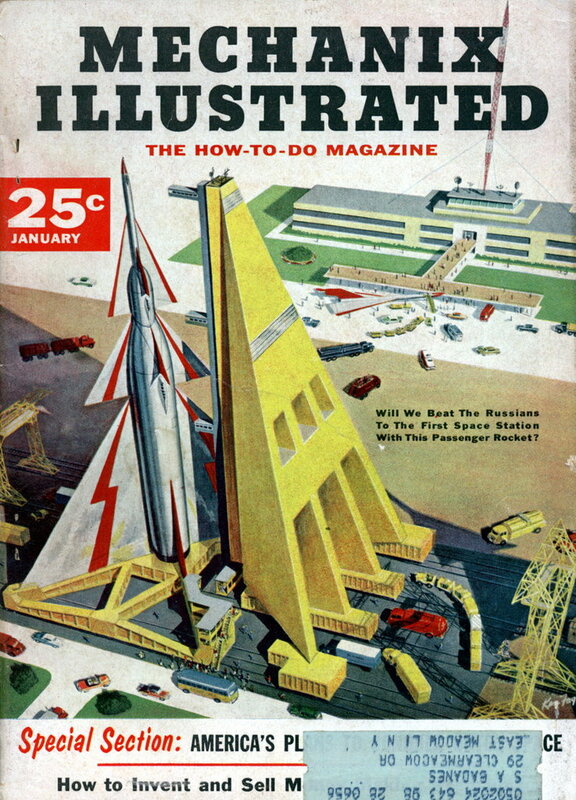 The three stages of the space ship are assembled at White Sands Proving Grounds where final check-outs are performed and the ship readied on the launcher. Riding up on elevators inside tall loading towers, the three separate crews board the ship, one crew for each stage. The 35 tons of cargo payload have already been placed aboard the top stage, which will be the only one to reach the space station. Final checks are made with the crews running pre-lift tests on each section of the ship. At zero-time, the 9,000-ton ship will lift, driven by clusters of rocket engines in Booster 1, the lower stage, producing 16,000 tons of thrust. The crew in Booster 1 will be in complete control at this time, but if an emergency occurs the three stages can be separated, each to find its way to a safe landing under control. The ship tilts slowly to the east and, after 90 seconds, all the propellant in Booster 1 is used up. The first separation now occurs with the upper two stages being ejected forward. The big clam-shell doors in the nose of Booster 1 close and it prepares to re-enter the atmosphere and glide to a landing. Somewhere in the vicinity of Big Spring, Texas, it will be low enough for the pilot to put down the landing gear and bring the huge booster to the ground at a landing speed of 175 mph, much like an ordinary airplane. The upper two stages continue their flight without Booster 1, and after 125 seconds Booster 2 runs out of fuel and separates, leaving the upper stage on its own. The nose doors on Booster 2 close and it makes a landing somewhere to the north of Prentiss, Miss. The final stage keeps on accelerating for another 70 seconds, then coasts upward to its rendezvous with the space station 1,075 miles above the surface. When it reaches the satellite orbit, it makes a final maneuver of four seconds’ duration, and the trip is complete. But on the ground there is much activity at Big Spring, Texas, and Prentiss, Miss. Jet engine pods are being slung under the delta wings of the two boosters to convert them into large jet airplanes. This will probably take only a day or two and is a simple procedure. Jet engines are removed and new ones installed on jet bombers today in a matter of hours. Then the crews fly the boosters back to White Sands. Take-off is made with the full power of the jetsâ€”16 of them on Booster 1 and 8 of them on Booster 2 â€”plus about 10 per cent of the rocket motors. Once in the air, the rocket engines are shut off and are used only for emergencies; the boosters fly on like normal airplanes under the thrusts of their turbo-jet engines. After both boosters have landed back at White Sands on long runways, the engine pods are removed and shipped by rail, truck, or air back to Big Spring or Prentiss. The big boosters are then given a careful and complete check and overhaul; any needed repairs or modifications are made. Then they are made ready for assembly into the complete space ship again. The final stage of the ship makes its return from the space station in the same manner as any of the craft visualized for space flight. It operates its rocket engines against its orbital speed and begins to spiral slowly back to the ground. At about 20 miles altitude it enters the atmosphere and the stubby delta wings enable it to glide down to a landing at White Sands in the same manner as the boosters landed at Big Spring and Prentiss. There it is also checked out and assembled atop the boosters, ready for another flight. What is so different about this idea of manning the lower stages with crews? In the first place, there is a greater margin of safety during the critical take-off phase. If there is trouble, each booster can be guided to the ground by its own crew instead of being left to fall freely on the land below. And there is the factor of weight; the crews and their associated equipment would actually weigh less than a parachute system designed to lower such large boosters to the ground. Another advantage of the system is that each booster may be tested by itself in the research and development phases of the project at first. They can each be flown as an ordinary airplane with both jets and rocket engines. New crews can be trained this way without subjecting them to a full-scale satellite flight before they had learned their jobs. The system, in addition to other advantages listed above, can make more trips in a given period of time due to the speed with which the boosters can be recovered, brought back to White Sands and checked-out again for flight. So the ship can actually transport a greater amount to the space station in a given length of time. The John M. Van Pelt mentioned in the article is my father, now 81 and retired. Dad’s influence was deep. I didn’t go into math and science (I’m an English teacher), but I do write and publish science fiction. Nice article, too bad Sputnik spoiled their fun! Charlie, is page 62 postable? Now if only NASA stuck with the design of having the orbiter mounted on the top of the rocket, rather then mounted on the side. We would still have Challenger and Columbia. As for the idea of controlled glider like boosters that would certainly be more logical then relying on air currents to drop the tank and boosters down via parachutes. Of course controlled remotely rather then on board humans in case of explosion.